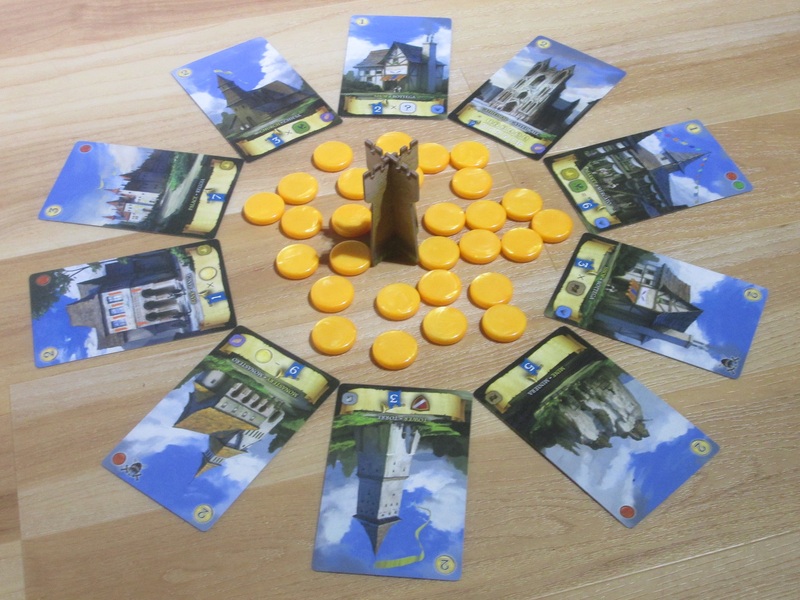 Minute Realms is a card-drafting/city-building game for two to five players. Players draft cards over eight rounds to generate points and protect against barbarian invasion. The player with the most points after eight rounds is the winner. 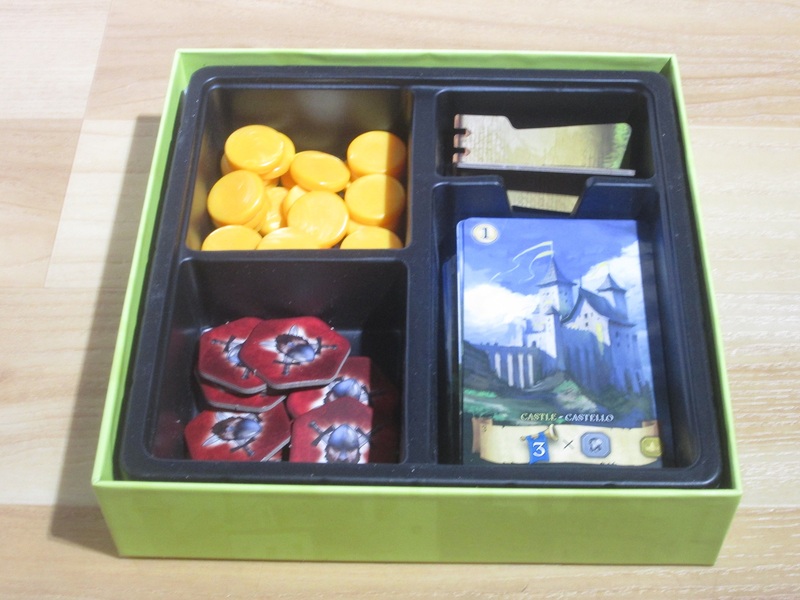 Minute Realms setup for four players. To begin, players set up the deck, sorting cards based on the number of players. The barbarian tokens are sorted and shuffled and stacked on space 1 of the round track. Cards are shuffled, and players receive gold based on seating order. 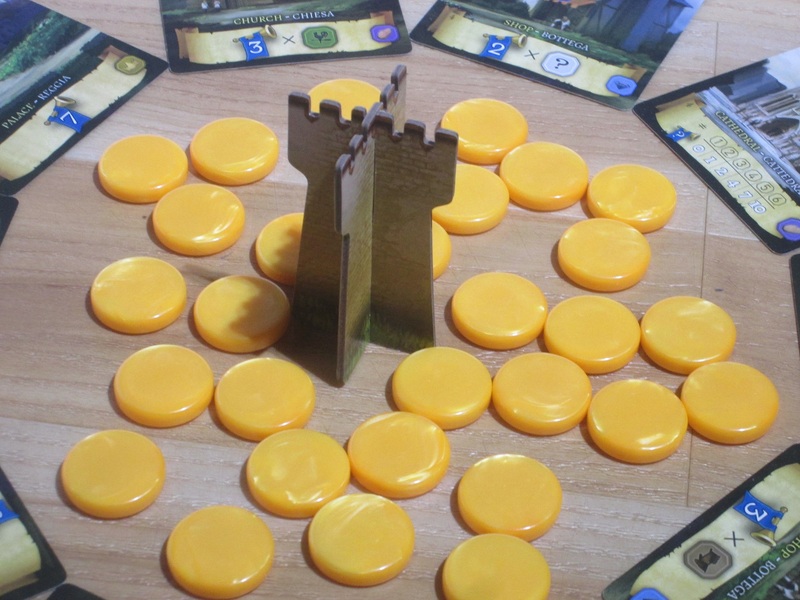 The player who most recently visited a castle takes the first player marker. At the start of each round, one card is dealt face-up to each player, and two cards are placed face-up in the center of the table. Beginning with the first player, each player may trade their card and then must build one card. 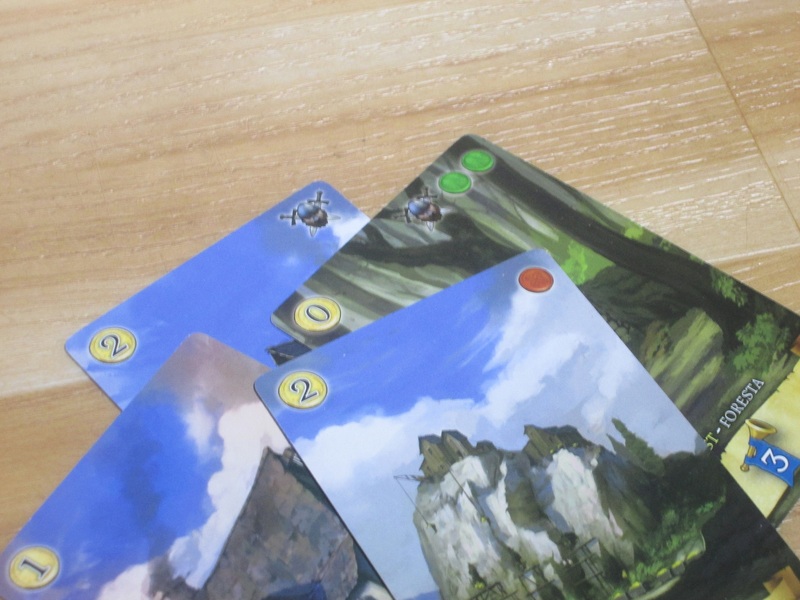 A player may trade their card by taking the card in front of another player or from the center of the table, giving the other player their card, and executing the trade actions at the top right of the card. Trade actions include paying that player coins, getting coins from the bank, or placing barbarians face-down on the barbarian track (only one new barbarian can be added per round). Instead of trading, players may take the card in front of themselves and not do the trading actions at the top right of the card. Trading actions affect the value of cards to build if you take them from someone else. 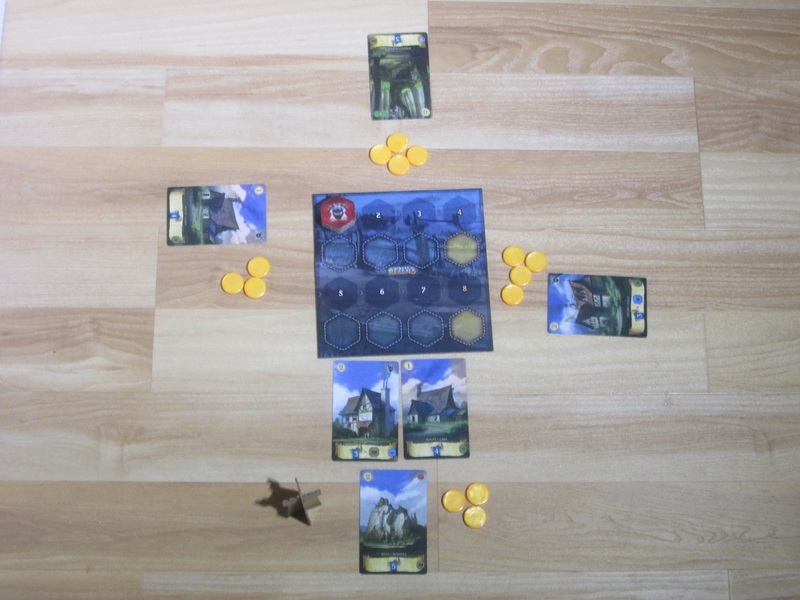 Then, after the player has chosen a card, that player chooses how to build it: face-up for the benefit on the bottom of the card by paying the card’s cost in gold, or face-down as a defensive bastion, gaining two gold from the bank. (Some cards may never be turned face-down as bastions.) After the current player has built their card, the next player takes a turn. Once all players have taken a turn, the two cards in the center of the table are discarded, the barbarian stack moves to the next round space, the first-player marker passes, and a new round begins. At the end of the fourth round, any barbarians on the barbarian track are flipped face-up, and any players that have fewer shield symbols than the total strength of the attack must turn one of their face-up buildings face-down. 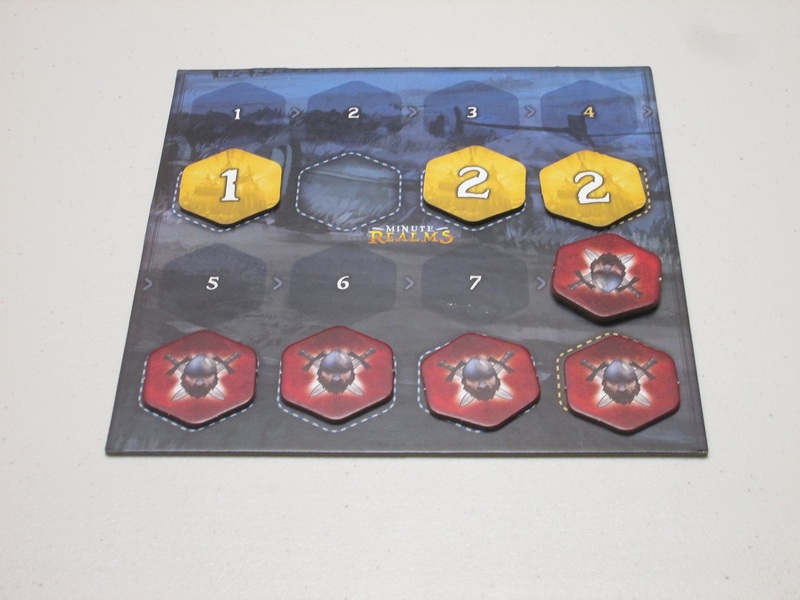 At the end of the eight round, the barbarian tokens from rounds 5-8 are added to the tokens from rounds 1-4, and players must defend again (or turn a card face-down). Any players who successfully defended in round 8 receive points equal to the barbarians’ attack value. At the end of round 8, players add up points from their cards and from successfully defending against the barbarians. The player with the most points wins. Minute Realms is a pretty clever title. Is it referring to the game’s size? It is small. To the game’s length? It is short. But the cleverness doesn’t stop at the title. 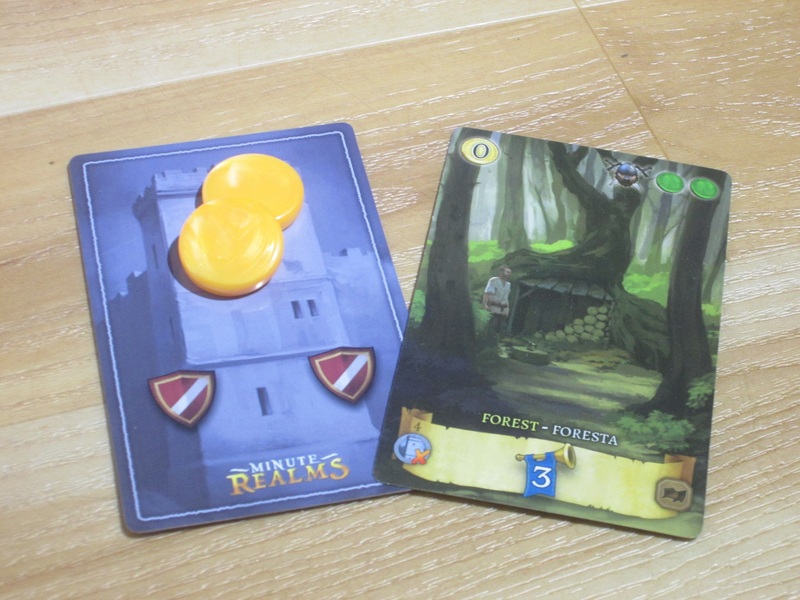 While Minute Realms lacks the depth of a longer drafting/building game like 7 Wonders, it fits its niche well, and it provides a mostly satisfying game in a slender package that if players aren’t clamoring for, they’re usually not blackballing, either. Probably the cleverest part of Minute Realms is the trading aspect of it. The game includes an interesting twist drafting, because each player has a card in front of themselves, but they can’t get too attached to it, kind of like a white elephant gift exchange. Someone with the right number might come along and take what you’ve grown to love. It’s satisfying to build a realm, even a minute one. What’s interesting about this is the trading icons at the top of the card. Some cards are better if you get them through trade; others are much worse. So when you’re considering which card to take, you have to weigh 1) how much the card you’re taking will benefit you; 2) whether the card you give will benefit someone else; and 3) whether it’s better to just take the card you’ve been dealt and call it a day. The clever consideration here is the barbarian track. Barbarians only enter the game once cards are traded, and not every card has the barbarian symbol on it. 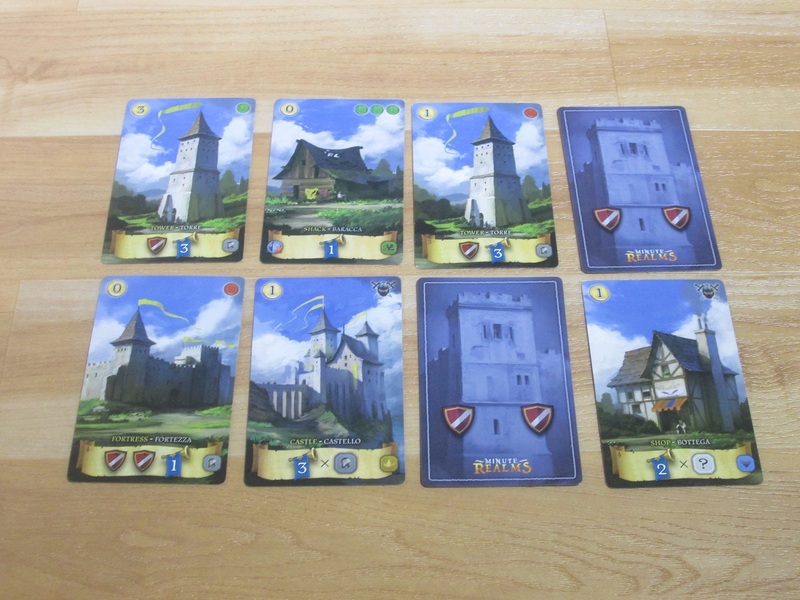 Building defensive bastions feels like a bummer of a turn–they’re not worth any points, and they even look boring in your tableau-but you’ll need them if you don’t want to be overrun. But here’s the thing: players are in control of the barbarians. There have been some games of Minute Realms where barbarians weren’t threatening in the least. I even asked after one game, “Why are they in it at all? They’re not that big of a deal.” The next game I decided to try a new strategy: I was like a cultist welcoming the Old Ones. “Let them come!” I said as I built my defensive bastions and traded every round for a card with a barbarian. The track filled up, and my neighbors chuckled nervously, thinking they could still defeat me with high-point cards, even if they had to lose a couple of cards to the barbarians. But at the end of the game, my barbarian strategy paid off. Ummm… Maybe I should build some bastions. I don’t tell you this to say that barbarians are underpowered or overpowered. I’ve seen other games where a player will build too many defensive bastions and forfeit points they could have otherwise had. The key here is that players have to weigh how best to get points and how best to keep points from their opponents. Sometimes this may involve siccing the barbarians on your opponents; other times it might involve doing everything in your power to keep the barbarians from coming. DEFINITELY should have built more bastions. Yet for this cleverness, the game is not difficult, either to play or to teach. It’s not a brain burner, and even with non-simultaneous play (the grease that keeps the wheels of 7 Wonders spinning effortlessly), it still finishes in fifteen to twenty minutes and is a decently satisfying snack. Minute rules make this easy to get into, and setup is quick. I’d say the worst thing about Minute Realms is that it’s a little bit forgettable. While it’s not likely to cause groans around the table when it’s pulled out, it’s also not likely to produce cheers. It’s a decent game but not a great one. In fact, one player asked, “Have I played this game before?” and indeed he had. Twice. For one player, at least, it was literally forgettable after two weeks. That being said, it fills a good niche in my collection–a super fast, decently interesting filler game that goes up to five players, ideal for closing out a game night after a more brain-burning experience. 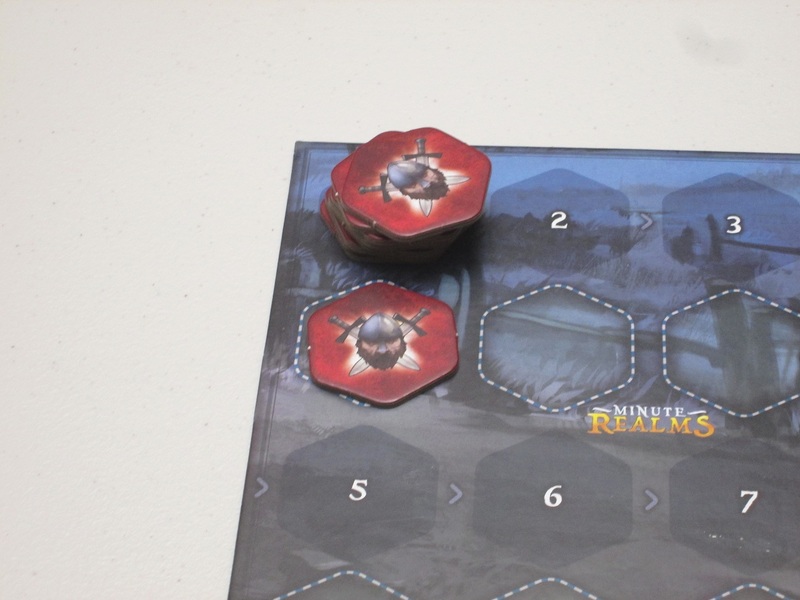 The components for Minute Realms are good. The gold pieces look like large Werther’s original butterscotch candies, and they are tempting (both to take and to eat). The card art is nice, if a little generically medieval, and the cards are larger format than the standard American or European card size. It gives the game a larger presence than it might otherwise deserve (maybe it’s intentionally invoking 7 Wonders? 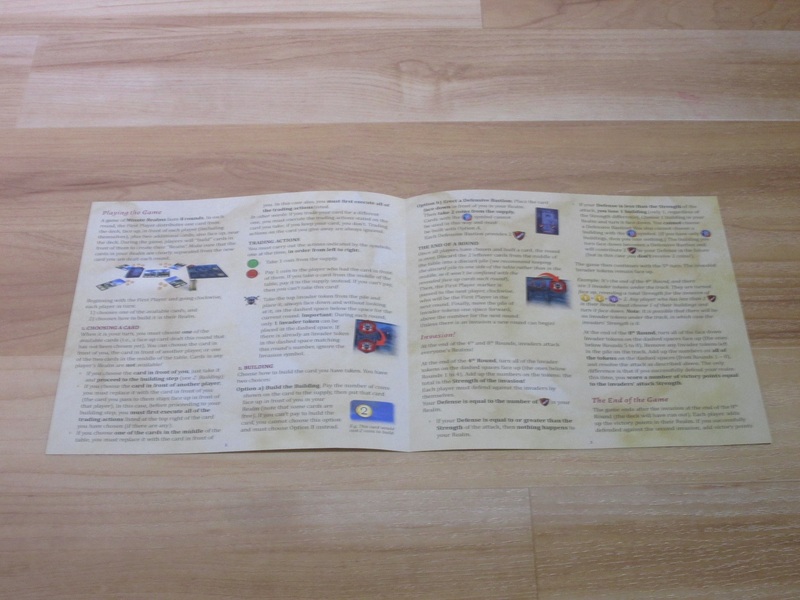 ), yet the game box is still pretty compact: think 7 Wonders Duel or slightly deeper than the Kosmos two-player line. 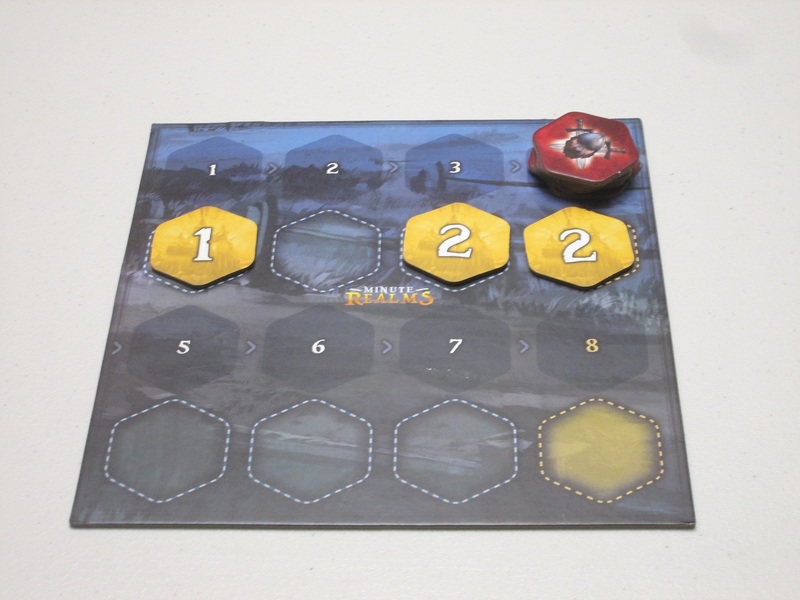 The first player maker is very cool, and again, for what the game delivers, the package is great. Ah! My final realm. And what a beautiful realm it is. The game advertises play from two to five players. I’ve played with three, four, and five, and I like the game at all those counts. I think I’m slightly biased in favor of the four- and five-player game, but it’s not a strong bias. I think the game works as-is, but I also wouldn’t mind more and more interesting cards. That would help the game to have a longer shelf life. The insert holds everything in place nicely. Again, Minute Realms isn’t likely to light the world on fire. The interaction is enjoyable, and there are some moments of schadenfreude (stealing cards from other players or watching their realm get sacked by barbarians), but it’s mostly a workmanlike drafting game that moves quick and doesn’t take up a lot of space. It’s not likely to be the jewel in anyone’s collection, but it’s minute enough that it can squeeze into most gaps, meaning you’ll probably get your money’s worth from this one if you like the concept. 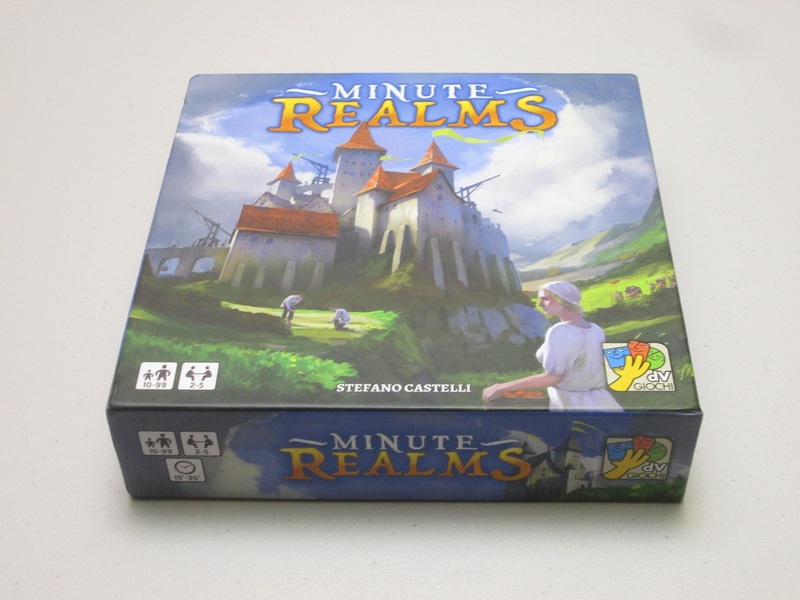 iSlaytheDragon would like to thank DV Giochi for providing us with a copy of Minute Realms for review.